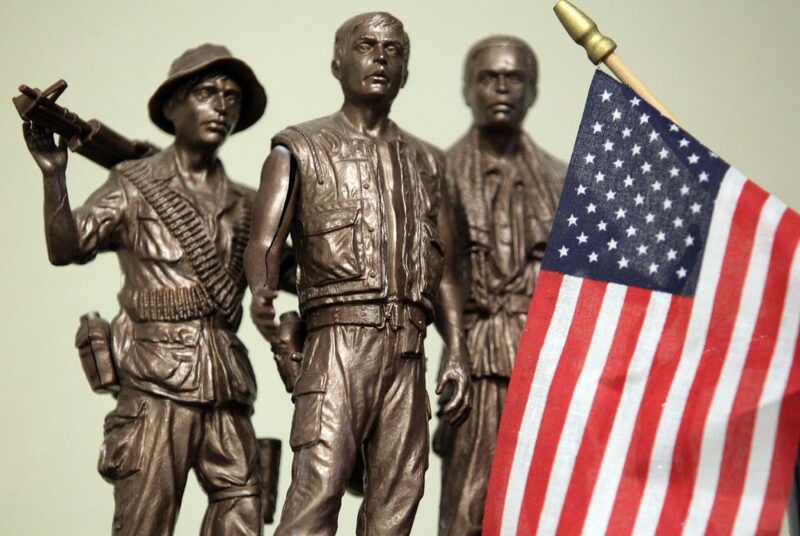 A statue depicting veterans is seen during the official opening of the new Hidalgo County Veterans Services Office on Thursday, Feb. 23, 2018, in McAllen. McALLEN — The roughly 28,000 veterans that reside in Hidalgo County now have access to a new, centralized veterans services facility, located on the west side of 10th street, between Freddy Gonzalez Drive and State Highway 107. According to the Hidalgo County public affairs division, the county began looking for a suitable location for the centralized office in 2017, and is leasing the space for $3,875 a month. In fall of 2017, the county also hired two additional veterans services officers. 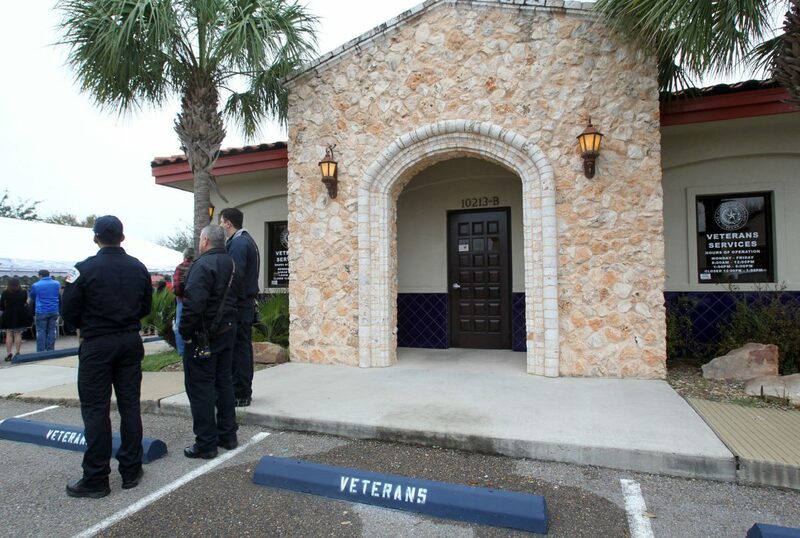 They previously had two in Edinburg and one in Weslaco, making a total of five VSOs serving county veterans currently. With this new facility, they will all be housed under one roof. “It’s a lot faster, a lot more efficient,” said Samuel Perez Jr., a veterans services officer for Hidalgo County, adding that the average wait time for an appointment has shrunk from about two weeks to less than three days, which he hopes will shorten with time. The newHidalgo County Veterans Services Office was officially opened Thursday, Feb. 23, 2018, at its new location on 10th Street between Freddy Gonzalez Drive and State Highway 10 in McAllen. The Veterans Services Office has identified 25,000 veterans that live in Hidalgo County. About 23,000 are registered with the office, which in turn qualifies them for federal and state benefits. The purpose of the office is to help veterans apply for the benefits they have earned. Marta Kang, Hidalgo County clinical director, works with the probation department, specifically in the Hidalgo County Veterans’ Court program, an 18-month alternative program for nonviolent offenders who have post-traumatic stress disorder, mental health issues and/or substance abuse issues. The VSO is often the first place veterans go to get help. But oftentimes, getting them through the door is the hardest part, Kang said. Unlike a VA clinic, Perez said, the county veterans service office is able to do home visits and assist service members with services that exceed their healthcare and disability benefits. The VSOs have been working out of the new McAllen office since Feb. 1, but it only became fully functional since last week. So far, they’ve heard positive feedback from their clients. “When they walked into this new location, they really felt like they were at home,” Perez said. The new Hidalgo County Veterans Services Office is located at 10213 N. 10th St., Suite B, in McAllen.